ADDITIVE INSIGHTS MMS NOVEMBER 2018 42 mmsonline.com Understanding Industrial 3D Printing Can My Machine Tool Access My Support Structures? 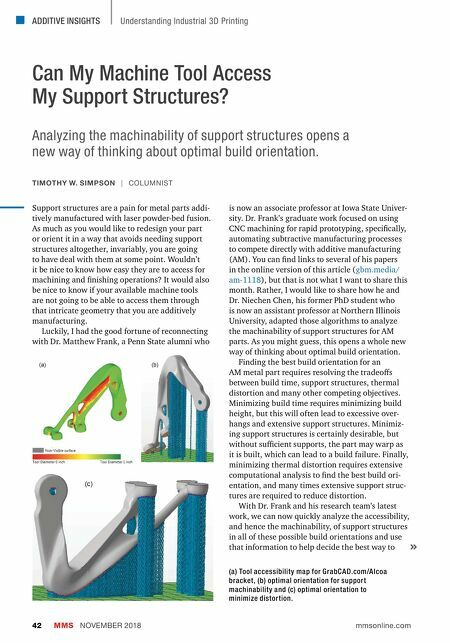 TIMOTHY W. SIMPSON | COLUMNIST Analyzing the machinability of support structures opens a new way of thinking about optimal build orientation. Support structures are a pain for metal parts addi- tively manufactured with laser powder-bed fusion. As much as you would like to redesign your part or orient it in a way that avoids needing support structures altogether, invariably, you are going to have deal with them at some point. 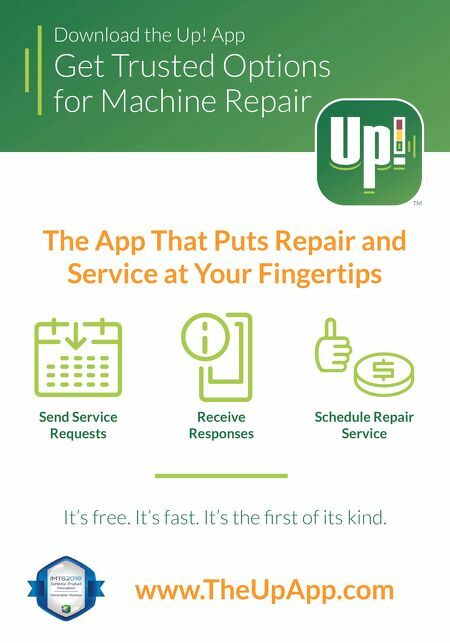 Wouldn't it be nice to know how easy they are to access for machining and finishing operations? It would also be nice to know if your available machine tools are not going to be able to access them through that intricate geometry that you are additively manufacturing. Luckily, I had the good fortune of reconnecting with Dr. Matthew Frank, a Penn State alumni who is now an associate professor at Iowa State Univer- sity. Dr. Frank's graduate work focused on using CNC machining for rapid prototyping, specifically, automating subtractive manufacturing processes to compete directly with additive manufacturing (AM). You can find links to several of his papers in the online version of this article ( gbm.media/ am-1118 ), but that is not what I want to share this month. Rather, I would like to share how he and Dr. Niechen Chen, his former PhD student who is now an assistant professor at Northern Illinois University, adapted those algorithms to analyze the machinability of support structures for AM parts. As you might guess, this opens a whole new way of thinking about optimal build orientation. Finding the best build orientation for an AM metal part requires resolving the tradeoffs between build time, support structures, thermal distortion and many other competing objectives. Minimizing build time requires minimizing build height, but this will often lead to excessive over- hangs and extensive support structures. Minimiz- ing support structures is certainly desirable, but without sufficient supports, the part may warp as it is built, which can lead to a build failure. Finally, minimizing thermal distortion requires extensive computational analysis to find the best build ori- entation, and many times extensive support struc- tures are required to reduce distortion. With Dr. Frank and his research team's latest work, we can now quickly analyze the accessibility, and hence the machinability, of support structures in all of these possible build orientations and use that information to help decide the best way to (a) Tool accessibilit y map for GrabCAD.com/Alcoa bracket, (b) optimal orientation for suppor t machinabilit y and (c) optimal orientation to minimize distor tion.